We have the Samsung Galaxy Core Prime at HQ and decided to bring you a quick video and some photos of it. The Galaxy Core Prime sits in the lower-bracket of the midrange and its highlights are the 4.5″ screen of WVGA (480 x 800px) resolution, the 5MP camera on the back, capable of 1080p video, and the 64-bit Snapdragon 410, coupled with 1GB of RAM. The hardware is completely made out of plastic but doesn’t feel cheap. The back panel on our unit is white but has a pearl-like effect and glistens under light. The screen on the front doesn’t shine with Super AMOLEDy goodness but is sharp enough with good colors. Buttons are pronounced and give out great touch feedback. 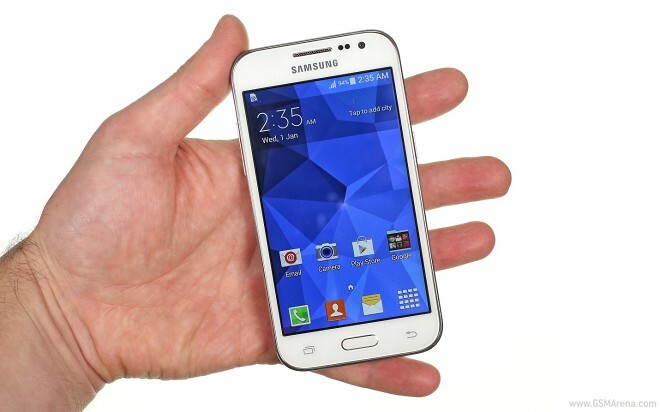 The Samsung Galaxy Core Prime has already launched on some regional markets for a price of 9,599 INR (or around €126). For the price you get a 5MP 1080p camera on the back, a 2MP front-facing shooter on the front, 8GB of built-in storage, microSD card expansion, 1GB of RAM and a 64-bit Snapdragon 410 chipset with four 1.2GHz Cortex-A53 processor. The software is a simplified version of TouchWiz on top of Android 4.4.4. The whole UI looks a bit oversized, expecially noticeable in the settings menu. There isn’t an overflow of features and the settings menu isn’t divided into tabs but instead shows a vertically-scrollable list of settings. Things run smooth on the Galaxy Core Prime. Here’s a walkthrough of the device in action.